This guide is intended for the end user of the Spreadsheet. The document provides information about the functionalities of the widget for data entry and management. The Kendo UI Spreadsheet is used for the implementation of related data and its visualization in a tabular format (rows and columns). This kind of data structuring provides for an easier management and analysis. The widget renders the touch and feel of a Microsoft Excel table by offering many cell-formatting options, styles, and themes while utilizing simpler and easy-to-master user interface. When you open the Spreadsheet, the widget automatically generates a worksheet and applies to it a collection of default settings. Click the highlighted area and hold while dragging it to the desired height. Release the hold. Click the highlighted area and hold while dragging it to the desired width. Release the hold. Click Undo [ ] on the Menu to reverse the sorting you made. Add a new column. Check which is the last active field of the columns whose data you want to sort. Then add a subsequent number (1, 2, 3, etc.) to each field of the recently added column ending with the field in the same row as the last field of the columns whose content you want to sort. In this way you can revert the sorting of the target columns by applying the sorting option in ascending order to the recently added helper column. Text fields: Choose any of the options referring to texts from the Filter by condition drop-down list. Fill in the field below to set the filter condition. Click Apply. For example, choose Text starts with, set the condition to E, and click Apply. The result shows all rows containing text fields that start with an E. You can alphabetically sort the filtered information by clicking Sort range A to Z or Sort range Z to A. Dates: Choose any of the options referring to dates from the Filter by condition drop-down list. Fill in the field below to set the filter condition. Click Apply. For example, choose Date is, set the condition to 6/30/2014, and click Apply. The result is a list of only rows containing fields that display the date 6/30/2014. Note that the date format may differ depending on the order of date components. Make sure you check the current format before applying this filter. Numbers: Choose any of the options referring to numbers from the Filter by condition drop-down list. Fill in the field below to set the filter condition. Click Apply. For example, choose Is equal to, set the condition to 10230, and click Apply. The result is a list of only rows containing fields that display the number 10230. To retrieve all applied filters and sorting conditions, from Filter by condition choose None > Apply. Filter by value provides more options for filtering numbers. Uncheck All to clear all checkboxes, and choose the values according to which you want to filter the data in the selected columns. You are able to export the content of your Spreadsheet to Portable Document Format (PDF) or Excel format (.xlsx) files, as well as import Excel Workbook content to the Spreadsheet. Click Open [ ] on the Toolbar. From the dialog box select the Excel Workbook you want to import by clicking on it. Click Open to load its content. 2. In the File name field fill in a name for the file that is going to be exported. 3. From the Save as type drop-down list choose Excel Workbook (.xlsx). 4. Click Save to locally download the exported Excel file and follow your browser instructions to proceed further on. 3. From the drop-down list against Save as type choose Portable Document Format (.pdf). 4. From the Export drop-down list choose which part of the content you want to export—the entire workbook, active sheet, or a partial content selection. 5. From the Paper size drop-down list pick the size in which you want the exported file to be displayed. 6. From the Margins drop-down list select what the margins of the resulting pages—normal, narrow, or wide. 7. Indicate whether you want to display the content of the resulting file in a horizontal or vertical orientation by clicking on the respective icon. 8. By checking Guidelines against Print, your exported PDF document is going to display its content in a table format with gridlines. If you want to disable the gridlines, uncheck the button. By default, Guidelines is checked for you to provide for the better visualization of the content. 9. Checking the Fit to page option against Scale is going to automatically make the content from your spreadsheets fit within the boundaries of the exported PDF document. By default, Fit to page is checked for you to provide for the better visualization of the content. 10. By checking the Horizontally option against Center, the content of the exported PDF file is going to be centered according to the horizontal margins of each exported sheet. By checking the Vertically option against Center, the content of the exported PDF file is going to be centered according to the vertical margins of each exported sheet. By default, both options are checked for you to provide for the better visualization of the content. 11. Click Save to locally download the exported PDF file and follow your browser instructions to proceed further on. Insert textual, numeric, or textual and numeric characters of one and the same pattern in at least two subsequent column cells. For example, 1, 2. To copy the data series automatically, drag the fill handle across, down, or up the cells you want to fill. Note that the Auto Fill command copies the format of the cells with the initial data series and will apply it to the target ones. If you select just one cell and drag the fill handle to auto-complete adjacent cells, the command copies, but does not change in the existing pattern, the content from the initial cell to each of the target ones. Apply the Undo function Click Undo [ ] on the Menu to reverse the actions you made during your current session. The number of actions you can reverse using Undo is unlimited. Apply the Redo function Click Redo [ ] on the Menu to repeat the actions you made during your current session. The number of actions you can repeat using Redo is unlimited. Select an option from the drop-down list. The style of formatting is hinted to the right of each option. Type your formula/function and press Enter once done to see the outcome of your input in the cell. Note that when you start writing a function, the AutoComplete prompts you with the syntax. Choose the criterion from the drop-down list of options. A new window with criteria-specific options appears. Use the prompts and drop-down options to set the rules for modifying the content. 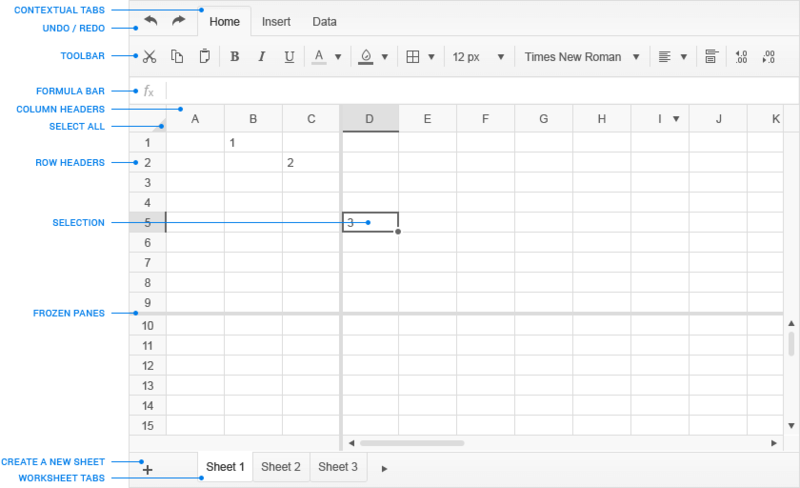 The Spreadsheet supports the implementation of custom editors. They facilitate your input of data in a cell by providing you with predefined date and list values that are already placed in the necessary format. For example, if you are asked to fill in a date in a cell, clicking the icon of the custom editor of that cell provides you with a calendar. Choose the desired date without bothering about the syntax you are supposed to use to fill it in. An icon appears right next to it. Click on it to see the options that are predefined for you to choose from. It is possible to define a custom name for a cell or a range of cells in the Spreadsheet. As a result, instead of typing the range in formulas later on, you can directly refer to the range by its name. Select a cell or a range of cells by using the mouse. For example, select the A1:C3 range. Click on the Name Box of the Spreadsheet. Type in the name of the range that is currently selected. For example, name the range MyRange. Go to a cell outside the range and type in the Formula Bar a formula which refers to the range by its name. For example, =SUM(MyRange)+2. Select the name of the cell or the range of cells from the Name Box. To close an active drop-down list or menu or exit an open window and then return to the worksheet, click Cancel whenever displayed as a command. To apply an options you have already selected, click Apply whenever displayed as a command. The Spreadsheet supports many of the Excel formulas and functions as seen in the List of Formulas and Functions. The Spreadsheet supports many of the Excel keyboard shortcuts as seen in the List of Keyboard Shortcuts. Because of specific requirements, browsers might not support the Paste command when it is initiated from the context menu or from the Toolbar. If you try to apply the command in either of these ways, a popup message is displayed informing you about the limitation. Use the keyboard navigation to achieve the desired result. Formulas that are very deeply nested, such as =sin(cos(sin(cos(...)))) or =A1+A2+A3+...+A200, might produce a stack overflow error. Even though the latter does not seem nested, it is internally treated as =((((...(A1+A2)+A3)+A4)+...+)+A200)). Use SUM when your case is similar to the second example of the nested formulas above. If to use SUM is not possible, avoid nesting values more than 100 levels deep. Note that the maximum depth depends on the browser, but one hundred is considered to be a safe limit.